In the middle of last year the writer Neal Stephenson caused a minor kerfuffle when he declared it was time for Science Fiction to give away its contemporary obsession with apocalyptic scenarios and dystopias and return to the hopeful visions of SF’s Golden Age in the 1950s and 1960s. Whether Stephenson’s characterisation of contemporary SF as nihilistic and inward-looking is fair is questionable, as is his assumption that SF’s real value lies in its capacity to inspire scientists and visionaries. Yet there’s little doubt the new novel by SF luminary Kim Stanley Robinson, 2312, is precisely the sort of big-picture, outward-looking story Stephenson wanted to see more of. 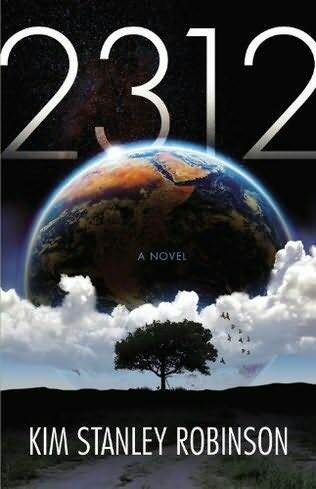 Set, as the deliberately provocative title suggests, 300 years from now, 2312 imagines a future in which technological and scientific advances have let humanity spread outwards into the Solar System. Made habitable by vast terraforming projects Mars and Venus are now home to thriving societies, likewise the moons of Jupiter and Saturn host an array of cities and habitats, as do the asteroids. Even that most hostile-seeming of worlds, Mercury, is home to a human city, the beautiful Terminator, designed to move with the sunrise across the surface of the planet. Robinson’s vision is spectacular and often breathtaking, especially in set-pieces like the opening chapter, in which sunwalkers race the dawn across Mercury or a much later scene in which millions of wolves and bears and caribou bred in habitats in space descend towards the wheatfields of an ice-free Arctic in clear bubbles. Yet the world the novel depicts is not one without its problems. Fuelled in part by the increasing scarcity of colonisable space, tensions are growing between the off-Earth colonies, a situation made worse by the increasingly erratic nature of the Martian Government and discord within the Accord that underpins the economic relationships between them. But the biggest and most intractable problem is not the new worlds but the Old. Crowded by a population many billions larger than our own, irrevocably altered by climate change, Earth has become a development sink, an intractable, solution-resistant mess whose internal problems threaten the stability of the entire solar system. This particular vision of the future – environmental catastrophe on Earth followed by a rapid and transformative expansion into the Solar System – is common to much contemporary SF. And while Robinson’s version is perhaps less plausible (and certainly less densely imagined) than the version explored in Paul McAuley’s stunning Quiet War series or Alastair Reynolds’ recent Blue Remembered Earth, it nonetheless presents a future that is by turns awe-inspiring, unsettling and challenging, not least in its preparedness to demand the reader think seriously about the possibilities of technologies such as terraforming. Robinson has dealt with these questions before, not just in his classic Mars Trilogy, but in his more recent Science in the Capital series, Forty Signs of Rain, Fifty Degrees Below and Sixty Days and Counting, which depict the race to devise solutions and adaptations to deal with rapid climate change. Yet in 2312 these questions are embedded in a larger exploration of the forces that underpin social change and development. Whether the book’s answers to these questions are satisfying is probably at least partly a matter of perspective. For while Robinson is too intelligent and subtle a writer not to be aware of the dangers of treating science as a panacea for all human ills, he is, ultimately, a product of the very mindset that gives rise to this assumption, a fact made explicit by the novel’s frustration with Terran resistance to technological solutions to their planet’s problems. It’s a problem that’s underlined by the novel’s plot, which is driven by the rise of a new and seemingly dangerous form of artificial intelligence, an event the novel not only seems unprepared or unwilling to grapple with the ethical dimensions of, but which it chooses to resolve in a manner is both oddly perfunctory and – more importantly – uneasily suggestive of the dangers of allowing the “rational” to take precedence over more human considerations. These are not small criticisms, nor is it coincidental that they are criticisms that might also be made of Golden Age writers such as Heinlein and Asimov, both of whom shared Robinson’s belief in the transformative nature of scientific rationality. Yet neither do they detract significantly from 2312’s real achievements, in particular its power as a reminder not just of the possibilities science opens up, but of SF’s importance in opening our minds to those possibilities. First published in The Saturday Age, 5 July 2012.